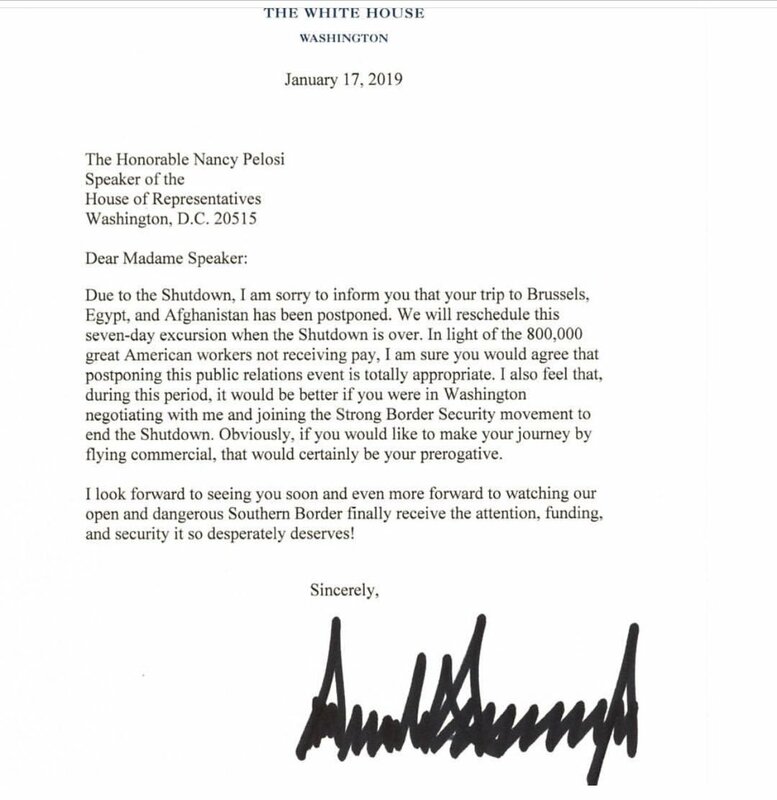 Nancy Pelosi’s scheduled trip to Brussels, Egypt, and Afghanistan has been “postponed” due to the shutdown, according to a letter President Trump sent to her on Thursday. He told her she could fly commercial if she chose. The temperature in her office is likely really warm right now, especially since the bus to take them to the airport was waiting to leave when she got the letter. Then of course, she’s the one that told the President he should “postpone” his State of the Union address or send a letter because of the Shutdown. Zzzzing. She opened the door, the President stepped through it. Due to the shutdown, I am sorry to inform your that your trip to Brussels, Egypt, and Afghanistan has been postponed. We will reschedule this seven-day excursion when the Shutdown is over. In light of the 800,000 great American workers not receiving pay, I am sure you would agree that postponing this public relations event is truly appropriate.I also feel that during this period, it would be better if you were in Washington negotiating with me and joining the Strong Border Security movement to end the Shutdown. Obviously, if you would like to make your journey by flying commercial, that would be your prerogative. The bus had just arrived to take them to the airport when the letter was sent. Now let’s think about this. 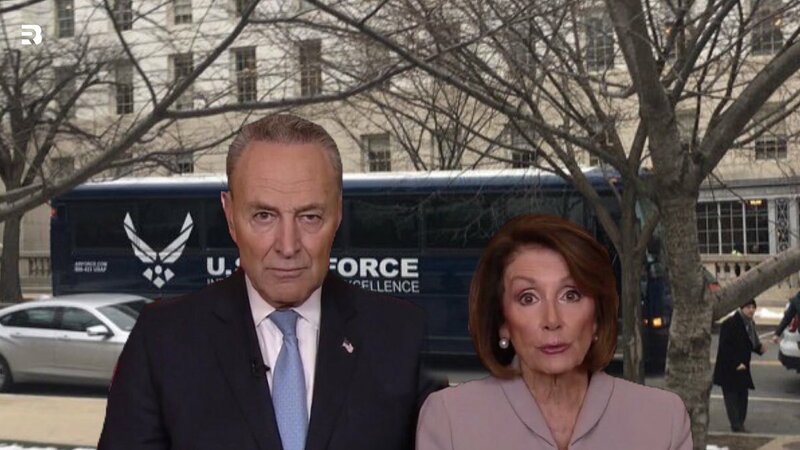 Trump tells Pelosi she and her colleagues can fly commercial if she wants – into a war zone. And not on the taxpayer dime. That’s one thing people seem to forget- everything these people do comes out of OUR pockets. Of course the move’s humor was totally lost of Democrats and the left. Some of them called him “childish,” and said that he was having a “temper tantrum.” Even Lindsey Graham called the letter “inappropriate.” Others said it was a perfect comeuppance to Nancy Pelosi.